Photo: National Soccer Hall of Fame. Archie Stark in action with Bethlehem Steel FC. The 2014 FIFA World Cup is now only a few days away. The U.S. National Team has slogged through three friendlies, experimenting with different XIs within the so-called diamond formation. Questions abound as the team prepares to face the Group of Death. Did Jurgen Klinsmann make a mistake leaving Landon Donovan off the roster? Is excluding the Greatest American Player Ever a recipe for surefire disaster? As the saying goes: time will tell. Until then, however, take some solace in the fact that Donovan is not the first questionable snub in the history of U.S. soccer, and the team has often survived baffling player selections or other scenarios that found top players not donning the national team kit in a World Cup. 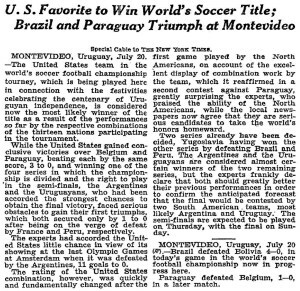 It is hard to imagine today, but the United States were actually one of the favorites to win the inaugural World Cup in Uruguay. To be fair, this was partly because of the depleted pool of competition: many European countries begged off because of the travel, and England and Scotland had quit FIFA in 1928 in a dispute of the status of amateur players and would not participate (England and Scotland, along with Wales and Northern Ireland, rejoined FIFA in 1946). However, it was also because the core of the U.S. team played its club soccer in the American Soccer League, at the time, probably the top domestic league outside of the UK. New York Times, July 20, 1930. Those were the days. 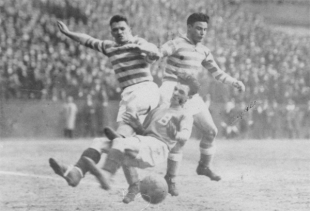 The 1930 squad featured all of the players you would expect to see from that era: Billy Gonsalves, Bert Patenaude, Jimmy Douglas, and about a dozen other ASL stars. However, a player who five years earlier had scored an incredible 67 goals in 44 games (including 8 hat tricks) with Bethlehem Steel FC did not make the trip. Archie Stark, already capped twice for the U.S., took a pass on the 1930 World Cup team because he was unable to take time away from his business. Whether Stark’s presence would have allowed the U.S. to survive the brutal physical assault levied upon them by a thuggish Argentinian side in the semi-final is a moot question. Nevertheless, the U.S. third place finish in that tournament is all the more impressive when it is recalled the greatest pure scorer of his generation stayed home. By now we are well-acquainted with the tale of the plucky 1950 U.S. team–that feisty group of semi-pros who somehow managed to produce the greatest upset in World Cup history with a 1-nil win over mighty England. However, that upset tends to overshadow how solid the Americans were in that tournament–and begs the question if the addition of one player left home might have made a difference. The U.S. team in 1950 was solid and workmanlike. Frank Borghi was the prototype for all of the great American keepers who would follow, playing behind a rock-solid defense anchored by Harry Keough and Charlie Columbo. Walter Bahr was the field general, and John “Clarkie” Sousa provided the flair. Ruben Mendoza. Photo: Courtesy of Wiki Commons. Where the team was lacking, however, was in the finishing department. Joe Gaetjens is known for the goal against England, and led the ASL in scoring that year, but he was a Chris Wondolowski-esque poacher, not known for actually creating opportunities for himself. Indeed, the goal against England came when he recklessly flung himself at a wild Bahr cross and managed to get a head on it. The U.S. were athletic–young, tough, and fast. The Americans actually went up 1-nil against Spain in their opening match before finally tiring and yielding three goals in the final ten minutes. Still, goals were hard to come by. If only Ruben Mendoza was available. A friend of Keough and a goal-scoring sensation in the St. Louis leagues, at 19 Mendoza was considered too young for the trip, and was left behind. Already guaranteed a spot in the 1994 World Cup as host country, it was imperative that the U.S, qualify for the 1990 tournament lest their presence four years later appear illegitimate. Thanks to Paul Caligiuri, the team made it to Italy. 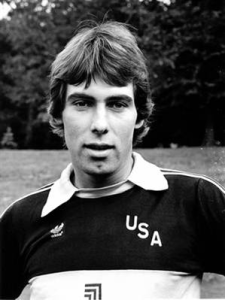 Coach Bob Gansler–a long-time college coach–decided to take what amounted to a college all-star team to the 1990 World Cup. While some players (Caligiuri, Peter Vermes) had experience, the vast majority of the team were inexperienced players and recent college graduates. Unsurprisingly, the team made a quick, inglorious exit from the tournament. Arnie Mausser earlier in his US career. Photo courtesy of National Soccer Hall of Fame. Among the experienced players who could have helped were Ricky Davis and Hugo Perez. The former–a star midfielder with the New York Cosmos and the long-time captain of the national team–was injured, and Perez was also lost to injury. The more troubling omission was goalkeeper Arnie Mausser. The 36-year old was in his prime (as it is well-established goalkeepers peak later in their careers), and was still excelling with the Ft. Lauderdale Strikers of the American Professional Soccer League. Already capped 35 times for the U.S., one would think that his experience and ability would have been a must on such a young team, with an especially inexperienced defense. Nevertheless, the future Hall of Famer never got a sniff, as Gansler elected to go with 21-year old former Hermann Trophy winner Tony Meola. One could argue that 1990 was “sacrificed” to give the young players experience for the 1994 tournament. Still, a better showing at that tournament might have also given the program momentum. Fate may have kept Davis and Perez out of the picture, but Mausser’s exclusion remains a head-scratcher. For all the fuss over Donovan, his exclusion is far from the worst in U.S. history. 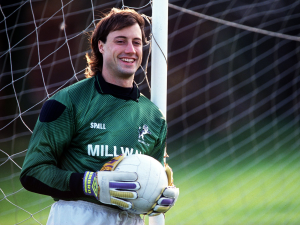 In 1992, Kasey Keller–the backup keeper on the 1990 U.S. team–signed with Millwall in the English Premier League. He was an instant sensation, and was named player of the year by Millwall fans in 1992-93. ESPN rated him as the third best-goalkeeper in the world in 1993-94. And he was left off the 1994 U.S. World Cup team. Of course, there were reasons offered by the idiosyncratic Bora Milutinovic. In the absence of a top-flight U.S. league, the national team was basically a full-time team, playing a heavy exhibition schedule and training together constantly. The fact that Keller had a “job” counted against him. A more insidious reason worked against Keller, as well. Eager to promote the 1994 World Cup, Tony Meola had been anointed “the face” of U.S. soccer. Not a bad choice, given his handsome looks. And, to be fair, a pretty safe choice, given the fact that Meola was a very good keeper in his own right. But Keller was on top of the world in 1994. However, having “The Face” suddenly riding pine come tournament time would have been awkward, if not embarrassing. Similarly, it would have been awkward having Meola looking over his shoulder during the tournament by having one of the world’s best keepers on the bench. So Keller was left off the team. The passage of time has allowed people to forget two crucial gaffes by Meola in the 1994 tournament–a weak short-side goal conceded to Romania in the last game of the group stage resulted in the U.S. being matched against Brazil in the second round instead of a flummoxed Argentina side, and then another questionable short-side, game-deciding goal allowed in the Brazil match. Would Keller have made the same mistakes? 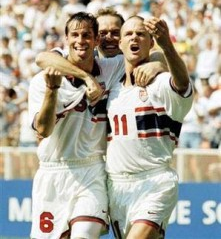 Harkes and Wynalda in happier times. By 1998, John Harkes had had a full career–first American to score in an English League Cup final, two time MLS Cup winner with D.C. United, veteran of the 1990 and 1994 World Cups, and named “Captain for Life” by U.S. manager Steve Sampson. Oh…and he was left off the team before the 1998 World Cup. At the time, it was a stunning decision–very similar to Donovan’s omission. After a “last place” finish in the tournament, Sampson was vilified over the omission. Of course, we now know why: Harkes was allegedly sleeping with teammate Eric Wynalda’s wife. Harkes would later return to the U.S. squad. And his omission probably had little to do with the team’s awful performance in 1998. But it was a shocking omission at the time. It is worth noting one almost omission. 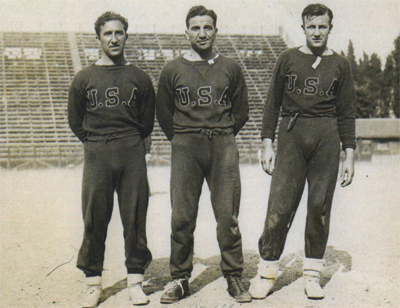 The U.S. entered the 1934 World Cup in Italy a shadow of the team that took third place four years earlier. With the original ASL gone, the team was comprised primarily of semi-professionals–albeit semi-pros who once made a good living in the ASL. One player who was not an ASL veteran, but who was tearing it up in the semi-pros, was Aldo “Buff” Donelli. The 27-year old was starring with Heidelberg SC in western Pennsylvania. However, manager David Gould was not interested in selecting the Morgan, PA native. It took a near-mutiny, led by Billy Gonsalves, to secure his selection to the team. A good thing, too. 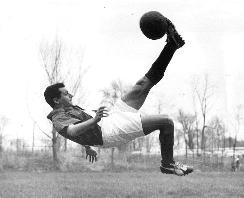 Donelli scored all four goals against Mexico in a “play in” game to qualify for the tournament (incredibly, both teams had to travel to Italy for the match), and then scored the team’s only goal against the host country in a 7-1 drubbing. Although he received offers from Italian clubs, Donelli opted to return home and continue his involvement with gridiron football. He ultimately coached the Pittsburgh Steelers for a spell. You forgt about Taylor Twellman. He should have went MPV of MLS and leading score in qualifing. Whats up with that? While I’m inclined to agree with you, there was not a universal view that TT should have gone…like Jason Kreis before him, he was one of those guys who scored in the league but did nothing at the USMNT level. Indeed, we were talking about Wondo the same way until very recently. So, anyway…Twellman didn’t make the list. Twellman was not the leading US scorer in the qualification campaign for the 2006 World Cup. The leading goalscorers were Landon Donovan and Eddie Johnson (7 goals), DaMarcus Beasley and Brian McBride (4 goals), and Brian Ching, Eddie Lewis, and Steve Ralston (2 goals). Twellman had only three starts for the US in the the 2006 qualifiers, and they all came after the win over Mexico. His only other appearances in the qualifiers were as a sub in the 1-1 draw with Jamaica on Nov. 17, 2004 (2 minutes) in the 1-0 win over Trinidad & Tobago on August 17, 2005 (7 minutes). Twellman made 6 appearances for the US after that final qualifier (5 starts, 1 sub) and before the start of the 2006 World Cup, scoring a hat trick in the 5-0 win against Norway at home on Jan. 29, 2006, and 1 goal in the 3-2 home win over Japan on Feb. 10, 2006. When the US World Cup roster was announced on May 2, 2006, Brian Ching was selected over Twellman and so he did not appear in the three sendoff games against Morocco (5.23.06), Venezuela (5.26.06), and Latvia (5.28.06). Twellman’s omission from the roster may have been a surprise, but I think it would be tough to say it reached the level of being a snub. A bigger snub in 1950 than Mendoza might be Jackie Hynes, who died last year at the age of 93. He was the United States’ best attacking forward during qualifying in 1949, but he made the mistake of writing a letter to a friend back home in New York in which he made some quite mild criticism about how the U.S. team wasn’t playing as well as it might. Hynes words wound up in a newspaper column, where they were seen by Joe Barriskill, the secretary of the USSFA. Hynes never played for the United States again. that media often creates and then society wants to fix. Ah Ibra, your Buy Vidic remark is at the cetner of my plans this week. I sold Defoe for Bellamy last week, leaving a ton of money in the bank. Now that it’s time to move O’Shea, I’m trying to decide between Evra, which would leave enough cash left over to upgrade Figueroa to Skrtel next week, or going all out on Vidic. I think he’s the best cetner back in the league (although I’m biased) but I’m not sure he’s worth it in my situation.p.s. That ESPN move would be great. I usually use myP2P.eu to stream games not shown on FSC but in the past few weeks it appears they’ve removed all English games from their site.